concertina Archives - io design & illustration, inc.
One of the most unique projects I’ve worked on was illustrative designs for concertina maker Jeff Thomas. Creating an instrument that is beautiful to look at, as well as superb sounding was important to Jeff. Design work began with the end pieces, where the buttons for playing the concertina are accessed. The placement of these is fixed so the artwork had to precisely include those locations. The design on the end pieces is centered around a tree image, with leaves/branches extending out into a pattern as they reach the edges. 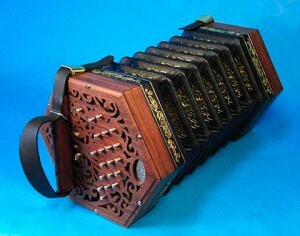 The design also serves to allow airflow in and out of the concertina while playing. Design created for the bellows. Using the style and elements from those end pieces as a guide, designs were created for the bellows papers and edging. These designs are gold tooled into the leather around the ends and on the bellows.